Anybody want to buy some tack? I'm selling my Dressage saddle, among other things. It doesn't fit Connor perfectly, the flaps are far too long for me, and our Dressage is pretty damn good in the Toulouse. That saddle's like "Hey, keep your hips underneath you or I'll do it for you!" As my English trainer says, "It's a very American thing to think you need two saddles below Prelim." She's also on board because the proceeds are going toward show season funding. Connor says, "It's show time, crazy lady!" For sale: 2002 County Competitor 17" W, $700 + shipping. Previous owner had it recently reflocked. Can include 24" SmartPak Breathable Dressage girth and Fillis irons at no extra cost - no leathers. Large thigh blocks and deep seat. Usual County fading on the cantle, panels and thigh blocks and the leather has unrolled off of about an inch of piping on the front right. Seriously could survive a nuclear bomb. It's too short for my jump saddle's short billets. 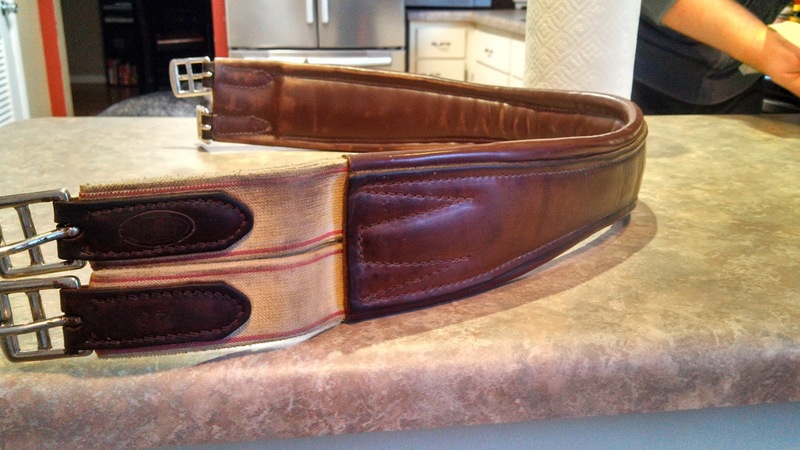 I bought it used, used it every ride for a year, and it still looks the same with perfect stitching and elastic. This thing is just going to keep going forever. Also for sale: RJ Classics size 0 Short Hunt Coat, navy blue with subtle maroon plaid. Like-new, hardly used. Make offer. I thought about keeping this coat around "just in case" I ever show in a sport that doesn't accept my black coat, but decided it looks better as an event entry fee than it does hanging in my closet. 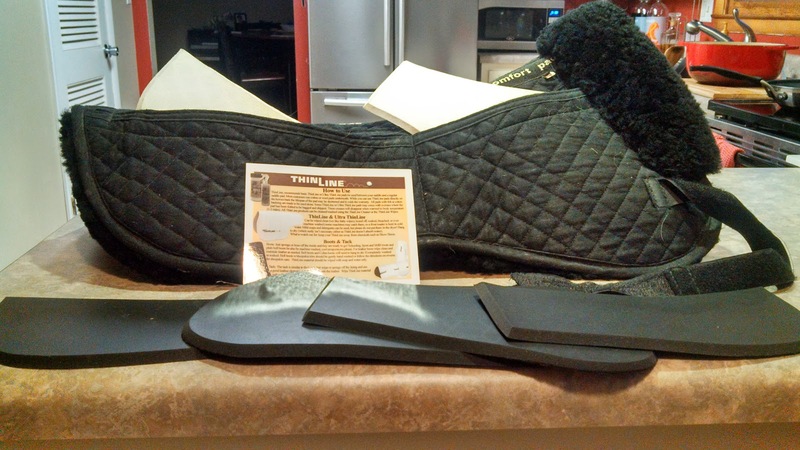 Unsurprisingly, the ThinLine SaddleFitter half pad I put up for sale on English Tack Trader sold in under 24 hours. Love this pad, it's just too big for my saddle. They don't make them anymore. If you can find one in Medium, snap it up for me! Comment if you're interested in anything and I'll send you my email address! 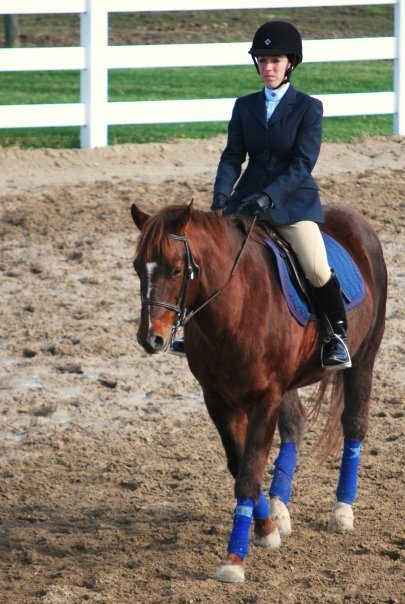 If your dressage saddle flaps are too long for you they'll be too long for me since we are the same height, I believe. Which leads me to ask what jump saddle do you use and how does it fit you? I'm having a devil of a time finding a jumping saddle to fit my short legs. As for the show coat it sounds like it would be a perfect fit for me. I have no idea what it is worth, though. Could you give me a ball park? I'm 5'0, are you? I have the Toulouse Annice, which I got on clearance from Classic Saddlery. It's a 16.5" W, Lynda at CS looked at pictures of Connor and I and recommended it, she'd do the same for you if you emailed her. She's up in Michigan. The Annice puts me into a really good position. The flaps are not terribly forward which is perfect for my short femur even on XC, and it has thigh blocks behind my leg. I have never felt a jump saddle put my hips underneath me the way this one does, I feel really secure. I think it's easier for us short people to find a jump saddle that fits than a Dressage saddle that fits. It's this coat: http://www.doversaddlery.com/rj-classics-essential-coat/p/X1-40712/. How is $75 + shipping (or come visit for a lesson! ;-))? Email me at jenifer dot slabaugh at gmail dot com. Thanks! yep, I'm 5'0" exactly. We can commiserate. I'll shoot you an email today. I agree with your trainer, 1 saddle can do it all. I used my Thornhill the whole time I evented Barry. And now I use the Isabel for everything with Comrade :) What will you use for the NDPC? I have looked into Thornhills for these wide-backed Cobs too. 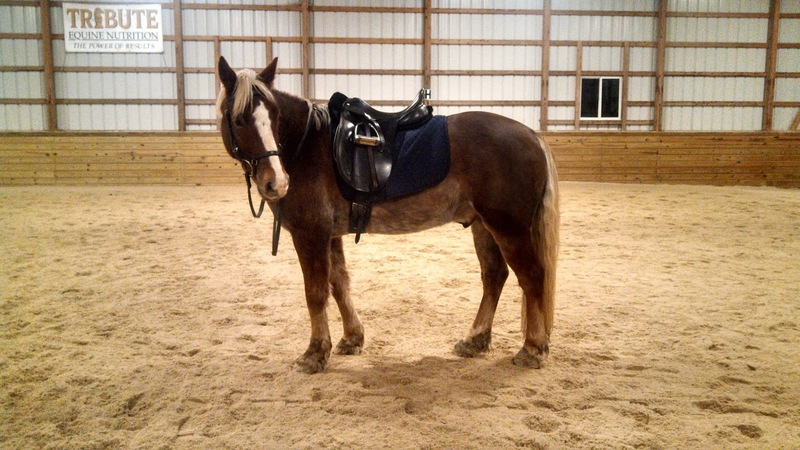 The Toulouse is still fitting really nicely though, my trainer gave it a clean bill of health today when she rode him. I'm going to get an anatomic girth for it though, his girth groove is so forward/shoulder is sloped so far back that I have to choose between letting it hit his scapula or letting it get pulled forward by the girth. Good observation on NDPC. I may be putting NDPC off due to finances. The math is so extravagant when I consider that I have to join two organizations just to do that one show. It makes more sense to sell the Dressage saddle and really focus on eventing this year. We'll see, still deciding. Good luck with the selling. Selling things is a blast when it works but such a headache when things sit… and sit… and sit :( I hope you have way better luck than I am with selling my 2 saddles! I know, I keep seeing your County come across English Tack Trader. It's so gorgeous, I wish it wasn't narrow. My trainer and I were just talking about how soft the high-end used saddle market is right now - you're either flat broke or you're rich enough to buy new. Good luck with it, I've had them sit before too, it's hard to look at them knowing what you could be doing with that money! I actually just sold my dressage saddle after I left this comment! So provided I don't end up with ebay buyer drama as everyone seems to be with saddle sales on there these days I am fairly happy. Took WAY less than I wanted to but it sold so thats something. Now for my jump saddle - which is ridiculously hard to sell (as in find a buyer for) for some reason which I never expected!